Step1: Take care not to move items from the affected area as it is very easy to spread the infestation to other areas. Step2: Inspect the whole room, bed bugs don't just live in beds. The longer the infestation has been present the further out from the sleeping are the bed bugs will have spread. In favourable conditions the female bed bug lays several eggs each day. Eggs are usually deposited in clusters around the area the bed bug is harbouring. Each female is capable of producing several hundred eggs in her lifetime. Eggs typically take 21 days to develop into a first stage nymph, this however depends on the temperature of the room in colder temperatures development time is increased. The bed bug goes through 5 stages before becoming an adult capable of reproducing. After each growth stage the insect moults leaving behind a skin cast. The time required to develop from a first stage nymph to an adult bed bug is typically around 45 days, this is dependent on the availability of a host. 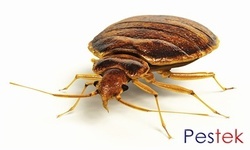 Bed bugs tend to harbour in cracks and crevices until a meal is available. Headboards, bed bases bed side cabinets� carpet edges are all typical hiding places for bed bugs. Bed bugs detect a build up of carbon dioxide produced as their host breaths this is the indication that a meal might be available. Without a host younger wigs will die however a mated female can survive for over a year without a meal.